This is contributed by Mr. Sajjad Qadir. Usmein Kewal, Usmein Classical Tazil, Indian Tazil Zyada Hote Hein, Sur Bhi Zyada Hein, Wording mein meaning ache hein, feelings zyada hein, mitaas bahut hein music mein, iske waste zyada popular rehta hai. This entry was posted on Friday, October 26th, 2001 at 5:30 am	and is filed under Meri Awaaz Suno. You can follow any responses to this entry through the RSS 2.0 feed. You can leave a response, or trackback from your own site. 31st julay 1980 was the death day for indian culture and also all over the world. 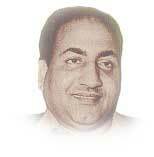 I am very sad to say no other Rafi will become in indian bollywood singer. my forthcoming bio on the legend. Dear Sajjad, H R U ? I have collection of this interview in my library. It is a great interview. When I got this one I did’nt sleep that night.